Deep amongst the narrow, labyrinthine shopping lanes of Palma’s historic old town, a short alley leads to an unassuming wooden door. You could walk past it a dozen times and not realise it’s there – and certainly not know what lies beyond. Armed with the knowledge of its existence on the tiny street of Carrer Impremta, I located the small rickety entrance, stooped, and stepped in – my eyes adjusted to the sudden darkness and nose filled with the musty scent of old rubble. The door clattered shut behind me, and with it I was in another world. Anyone who has stepped into a traditional riad from a bustling Moroccan medina knows the experience; when the clamour of the city is immediately shut out and replaced with an overwhelming sense of quiet and calm. I could even hear the chirruping of birds from somewhere high up among the lofty ceilings and piles of debris. This is the space soon to be transformed for the Impremta Garden development, an ambitious apartment complex project by Swedish developer Panorama Properties in collaboration with fellow Stockholm-based branding and interior architecture firm Whyte Lilja and Palma architects AVW. The huge and labyrinthine building has lain empty for over 10 years, and was discovered by Andreas Arkling, of Panorama Properties, who immediately saw its potential. “The incredible thing about Palma is the number of beautiful old properties that have been sitting empty and derelict for years, that just doesn’t happen any more in such attractive cities,” explains Andreas. 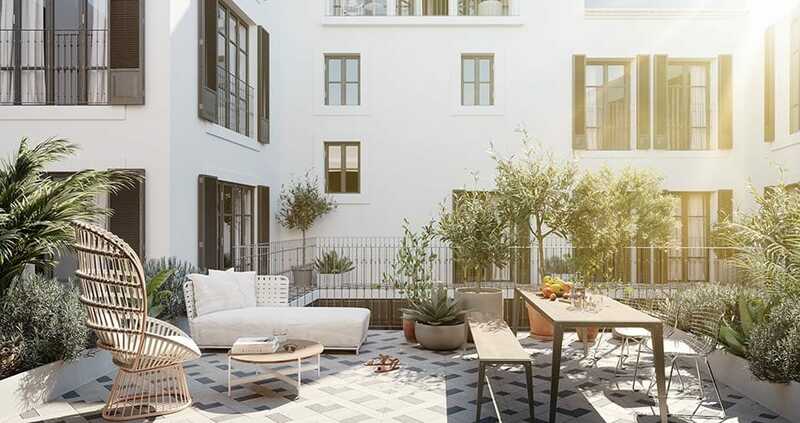 A core aim of the project is to retain as much of the property’s Old Mallorca medieval charm – but with none of the gloomy corners that can haunt this style of architecture. 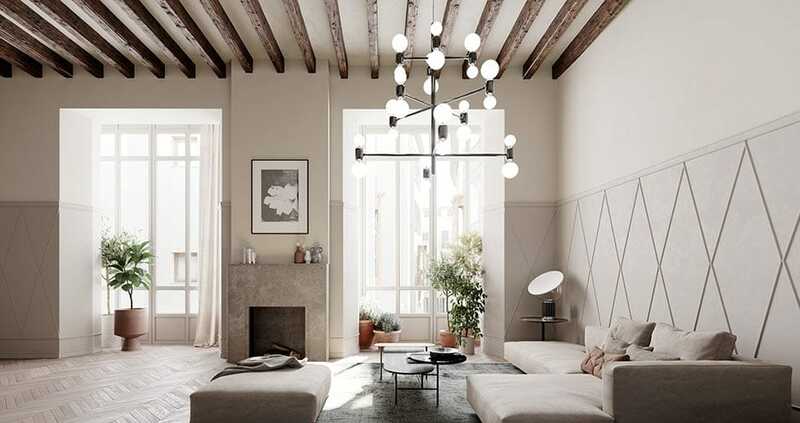 Original features are to be reconditioned wherever possible, retaining the building’s chunky wood doors, elegant wrought ironwork, and old wood beams. It was sadly not possible to integrate the property’s dizzying encyclopaedia of traditional tiles into the final design; though you can guarantee the tiles will be salvaged for some other project. Internal flooring will be mostly an elegant chevron pattern of smoked oak, while terraces will be finished in light and dark sandstone. The 20-month renovation will transform the space into 13 two- and three-bedroom apartments – including one community-owned unit which will be rentable to guests. Each of the apartments will have their own unique layout, most extending to private terraces with top floors boasting stunning cityscape panoramas over the capital’s rooftops. Others will open to Mallorquín ‘winter gardens’ or French balconies overlooking the lanes. 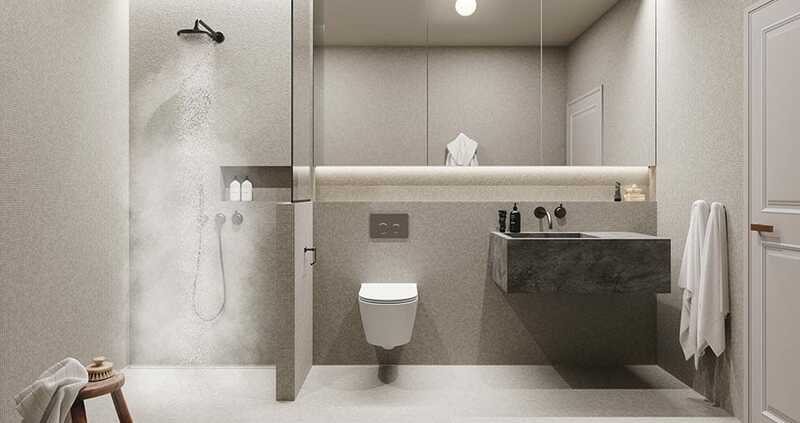 High-end touches are to include underfloor heating, luxury mosaic bathrooms, and designer kitchens in all units. 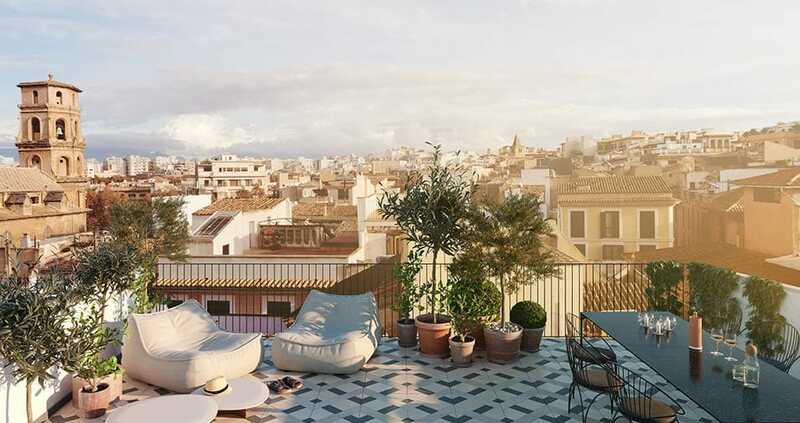 Apartments start at €690,000 and go up to €2.3million. The centrepiece of the project is the inner courtyard, overlooked by original enclosed wooden verandas, which are to be renewed to their former glory. 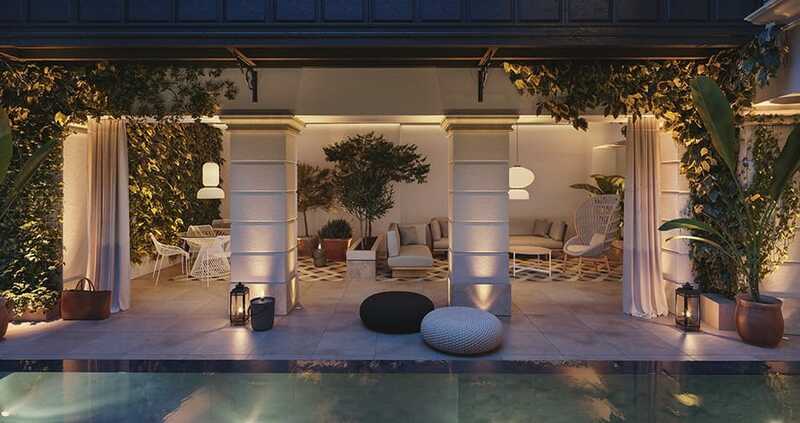 The space is also to feature a 10-metre-long communal pool – a genuine rarity in Palma old town and another feature wonderfully evocative of a traditional Marrakech townhouse. Explaining the vision behind the property’s interior design, Maria Whyte adds, “We set out to create interior spaces that had a distinct Scandinavian touch, but at the same time maintain the warm Mediterranean spirit.” Judging by the proposed plans, a grey-taupe palette, sophisticated lines, and contemporary fixtures will blend seamlessly with restored period features, light-filled spaces, and artfully arranged foliage. 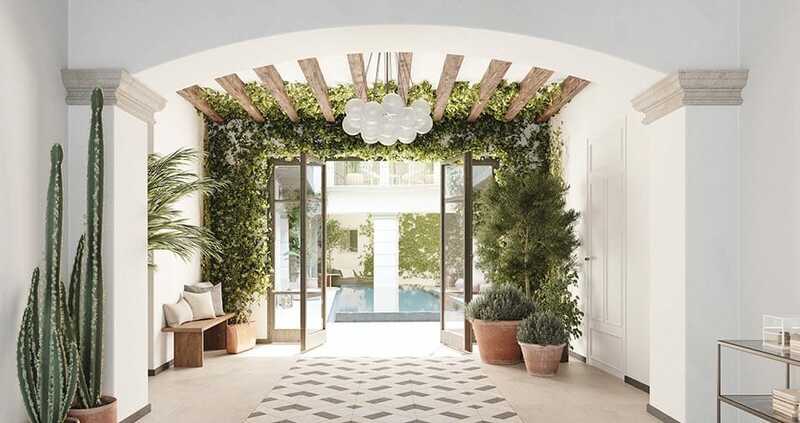 Combine these with the feeling of calm and ‘secret garden’ atmosphere and it is sure to result in one of Palma’s finest – and most secluded – urban hideaways. Click here to discover more apartments, villas and fincas for sale in Palma and other locations on Mallorca. 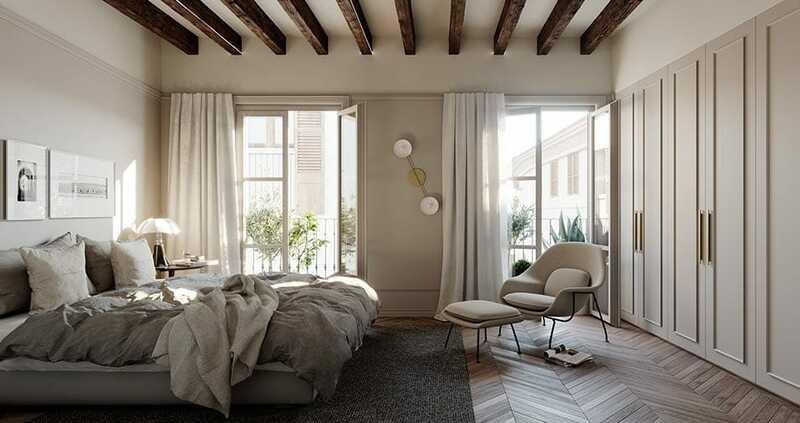 We hope you have found this article about the Off-plan luxury flats for sale in old town Palma useful and that you have many memorable stays in Mallorca as a result of our recommendations.